This Greek Gold Lambda Steel Shield will make you feel like a Spartan straight out of history when you carry it. Inspired by Greek history and Spartan design, this simple yet effective shield is among the very best of defenses against any enemy. 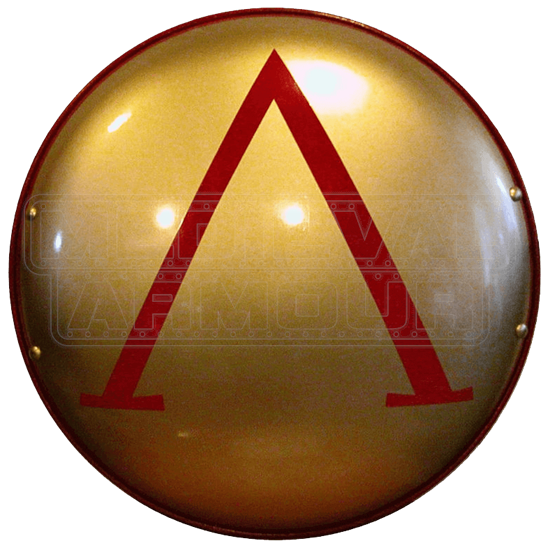 The shields front is colored a metallic gold and features the Greek letter Lambda printed in red. The thin border around the outside of the shield is also red and matches the color of the Lambda. This shield brings the Spartan sense of efficiency and effectiveness into the modern age with modern materials. This shield is made from thick dished steel and features a flat brace against the back, which makes carrying and wielding the shield more comfortable. The shield measures approximately 27 inches in diameter, which is more than enough to protect your entire torso. Heavy leather straps are attached along the metal brace on the back to provide a way to carry and use the shield. One strap is designed to go around the arm while the other is intended to be gripped by the hand. They are spaced approximately 11 inches apart. This creates a grip that is balanced and effective when held and used. The front of the shield has also had a topcoat applied to it that helps to protect the shield and preserve it from extended wear and tear. The Greek Gold Lambda Shield is a wonderfully functional shield that is ideally suited for keeping a warrior safe in battle. However, it also happens to look exceedingly good when worn to medieval reenactments and Renaissance festivals too, especially if it is worn by a Spartan warrior or a Greek Hoplite. Shield Weight: 8 lbs. 6 oz.